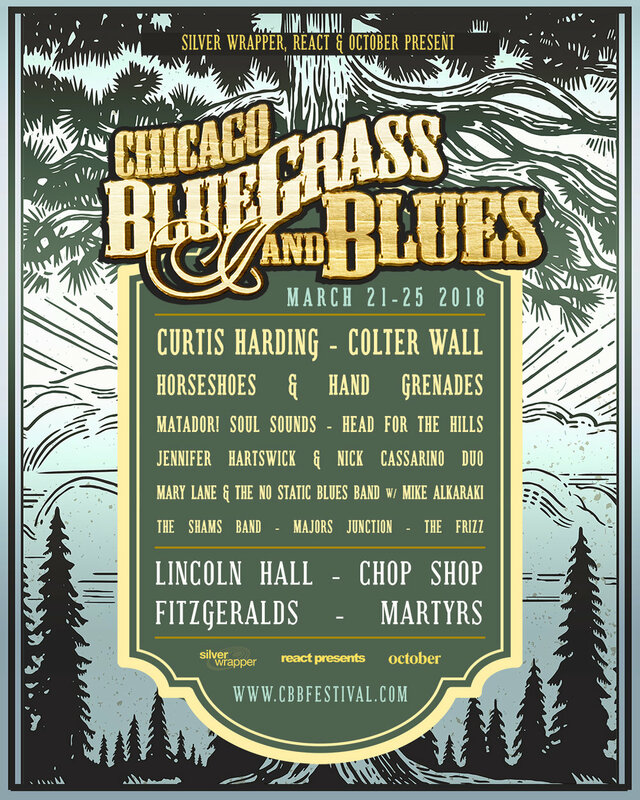 Silver Wrapper, React Presents, and October are thrilled to announce the return of the Chicago Bluegrass & Blues (CBB) series, welcoming some of the finest talents in Bluegrass and Blues, and the genres they inspire, including Curtis Harding, Colter Wall, Horseshoes & Hand Grenades, Matador! Soul Sounds, Mary Lane & The No Static Blues Band with Michael Alkaraki, and more. The 5-day event series runs March 21st through March 25th at some of Chicago’s most popular music venues including Lincoln Hall, Chop Shop, Fitzgerald’s, and Martyrs’. Tickets are on sale Friday, December 22nd at 11am CST at www.cbbfestival.com. Starting Wednesday, March 21st, Mary Lane & The No Static Blues Brand join with Michael Alkaraki at Fitzgerald’s to kick off the series. A longtime favorite of Chicago’s West Side blues scene, singer Mary Lane honed her skills in local juke joints alongside the company of Howlin’ Wolf, Robert Nighthawk, Little Junior Parker, and James Cotton, before relocating to Chicago in 1957. She took a four decade hiatus from recording before resurfacing in the early 1990s, leading to her full-length album Appointment With The Blues in 1997. Supporting are fellow local Blues and Bluegrass staples The Shams Band, Majors Function, and The Frizz. Tickets are available HERE. On Thursday, March 22nd, the series moves to Martyr’s with Matador! Soul Sounds, supported by Jennifer Hartswick and Nick Cassarino Duo. Combining diverse inspirations and a shared passion for jazz, funk, and soul, Matador! Soul Sounds is a newer outfit that brings an ensemble energy to their performances. They debuted this year at The Brooklyn Bowl for Live for Live Music’s Brooklyn Comes Alive 2017 and their debut EP “Get Ready” is coming in 2018. Tickets are available HERE. Curtis Harding takes Lincoln Hall on Friday, March 23rd. The child of a mother who sang gospel and a retired veteran, Curtis Harding has lived his entire life knowing music as the great communicator. He taps into the best parts of soul music, singing with earnesty that transcends the years and reflects upon modern realities. A penchant for what i-D calls “otherworldly, synth-driven soul” casts Harding as one of the most essential soul musicians of our time, and his new album Face Your Fear garnered mass acclaim, including a spot on NPR’s Top 10 Albums of 2017. Tickets are available HERE. Saturday March, 24th takes the series to Chop Shop with Wisconsin bluegrass outfit Horseshoes & Hand Grenades, supported by Head For The Hills. Bound by a love for bluegrass and old-time Americana and folk music, Head For The Hills founded in 2010 and quickly turned heads around the country, placing 3rd in Telluride Bluegrass Festival’s Band Competition in 2012, before going on to share stages with the likes of Trampled By Turtles, Railroad Earth, Merle Haggard, Yonder Mountain String Band, and countless others. They’ve recorded three full-length albums, most recently 2015’s Middle Western, with a fourth soon on the way. Tickets are available HERE. The series concludes on Sunday March 25th at Lincoln Hall with Canadian singer-songwriter phenom Colter Wall. At the age of just 22, Colter has wasted no time in establishing himself as one of the hottest names at the intersection of blues, folk, and Americana. His track “Sleeping On The Blacktop” found streaming success after being featured in the films Hell or High Water and Three Billboards Outside Ebbing, Missouri. His self-titled debut album released on May 12, 2017 to wide praise, charting on US Country, Folk, Heat, and Indie charts. Tickets are available HERE. Aiming to showcase the musical styles that have evolved from bluegrass and blues culture, Chicago Bluegrass and Blues (CBB) was born in 2008 of a collaboration between Mike Raspatello, Silver Wrapper and React Presents. Since then, CBB has hosted acts like The Avett Brothers, Bela Fleck, Grace Potter, Del McCoury, Edward Sharpe, David Grisman, Drive-By Truckers, Dr. Dog, Dawes, Honeyboy Edwards, Joe Pug, and The Skatalites, making stops at numerous venues across Chicago including Auditorium Theater, House of Blues, Aragon Ballroom, Concord Music Hall, City Winery, and many more. For more information on Chicago Bluegrass and Blues, visit http://cbbfestival.com.